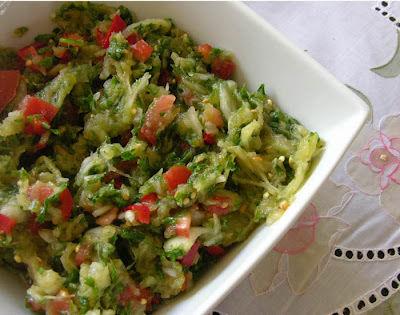 I grew up loving the stuffed vegetable dishes my mother makes: eggplant, zucchini, tomato, onion, all stuffed with a mixture of meat and rice and cooked in a sour tamarind sauce. I had a great onion crop last summer, so thought I'd share this recipe, a real treat, that used a few of my very large onions. The combination of the sweetness of the onions and the sour sauce is delectable, and the long cooking time adds extra caramelized flavor. 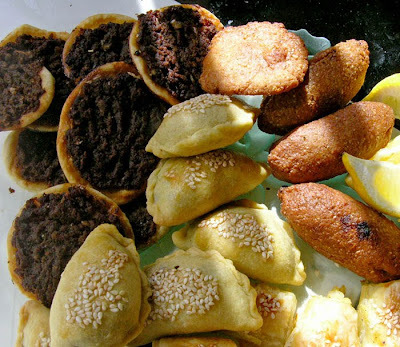 You can find tamarind paste in middle eastern or Indian groceries; pomegranate syrup, which is also sour, is an acceptable substitute. This recipe is from my cousin Poopa Dweck's book Aromas of Aleppo. Peel onions and make a vertical cut to the center and not more. Place them in boiling water and cook for 10-15 minutes, until they soften and begin to open. Drain, and when cool enough to handle, separate the layers. 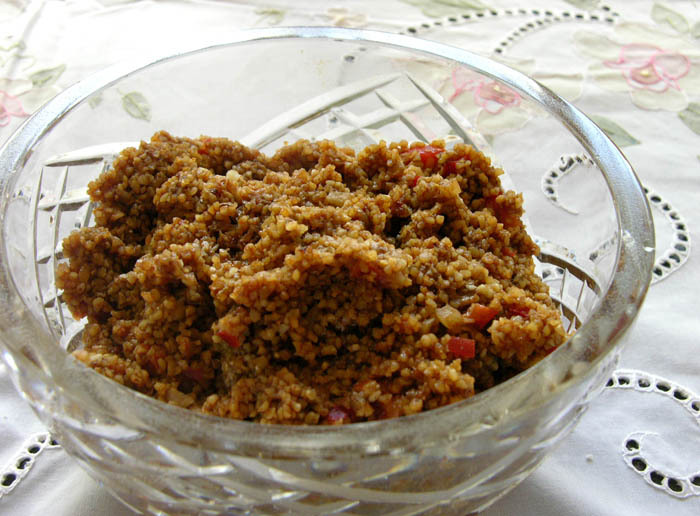 Spoon about a tablespoon of filling in each layer, more for larger pieces, less for smaller, then roll tightly. 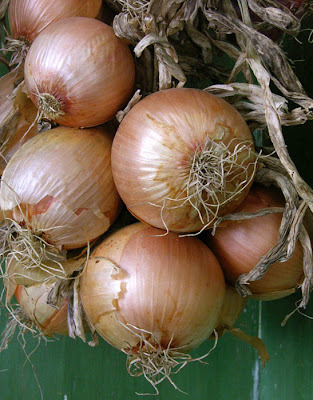 If you have filling left over, you can form it into balls and cook with the onions. Line the bottom of a medium saucepan with onion remnants or sliced potatoes; this will prevent the onion rolls from burning and sticking. Place the rolls closely in the saucepan; layering is fine. 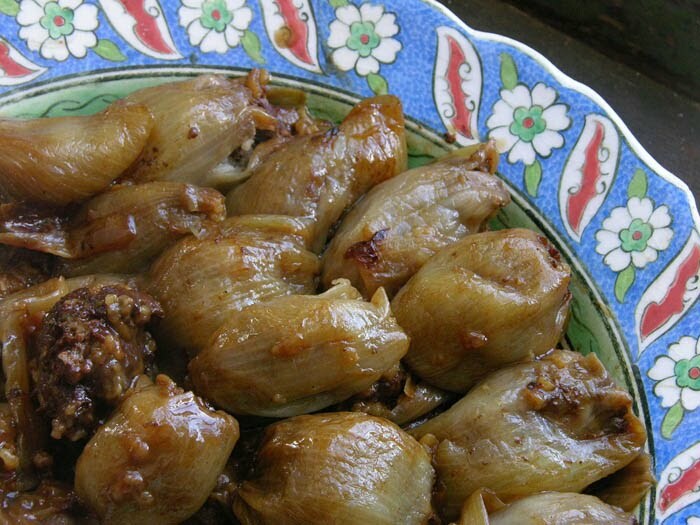 Combine the tamarind paste, lemon juice, salt and water and pour over the onions. Put a small plate on top to hold down the rolled onions. The liquid should cover the onions when pressed down with the plate. Bring to a boil on top of the stove, then simmer, covered, for 40 minutes. 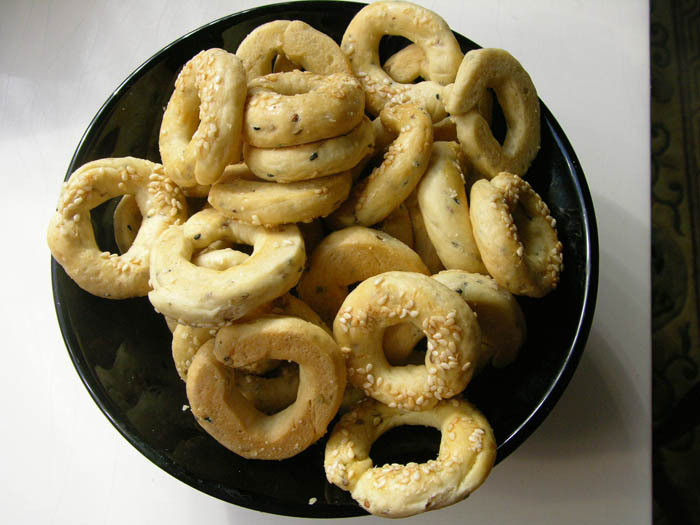 Transfer to a preheated 350º oven and cook for another hour and 20 minutes. 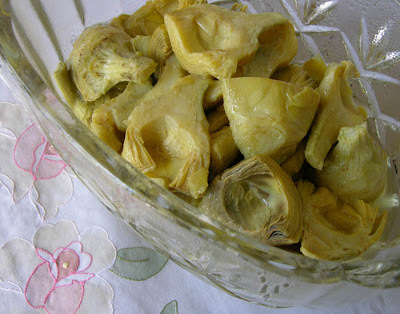 Remove them from the pot by turning it over onto a serving dish. If you try to lift them with a spoon or other utensil, it's more likely they'll break apart. As you can see from my photo below, I didn't make the prettiest rolls, but they are still delicious. Blue Bolts, egg tempera on calfskin parchment, 4 3/4 x 5 1/2 inches. 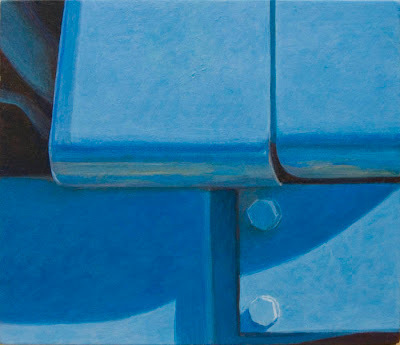 After working on my last painting, which was a disappointment, it was a pleasure to turn to this blue painting. I like the bulging planes over flat ones, broken by dark lines, the mysterious dark at upper left sheltering curving cylinders. It was not without its difficulties however, primarily owing to the blue pigments being transparent. 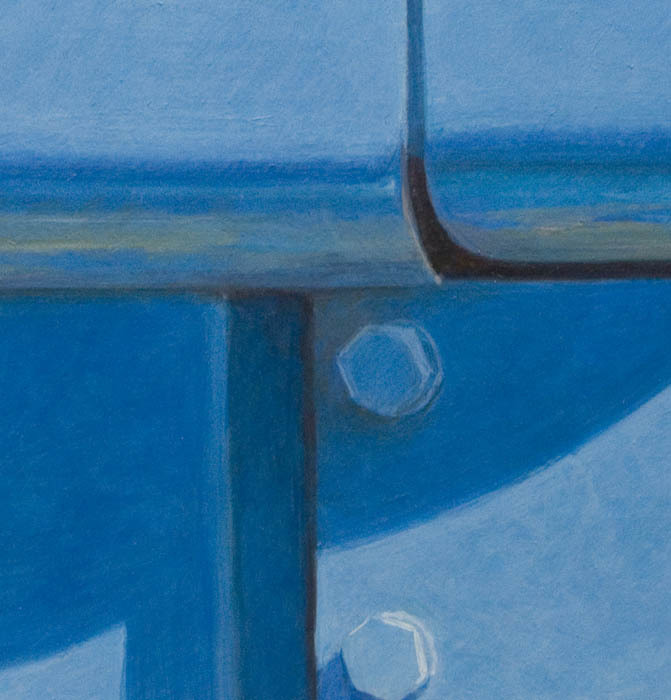 I used Ultramarine blue, Cobalt blue and Manganese blue cerulean, none of them opaque. 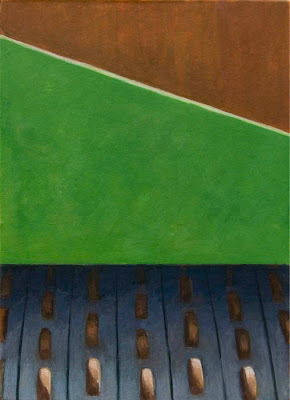 In order to achieve a moderately even surface in the light areas, I had to paint many many layers of color. 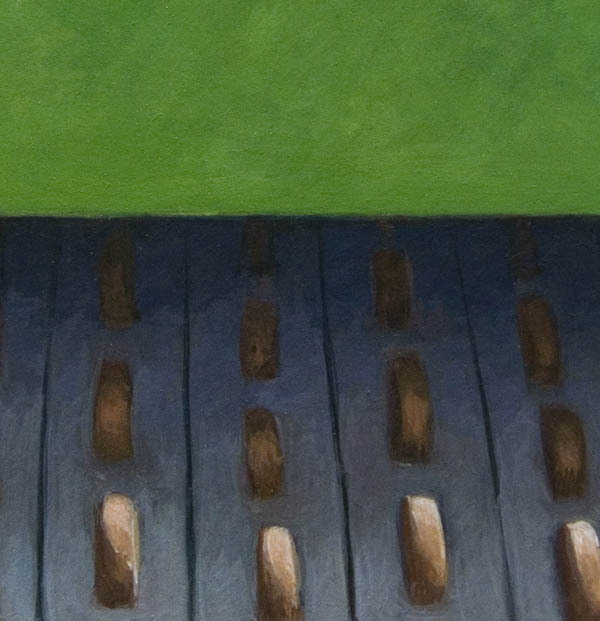 The resulting surface has some texture to it, but I hope it's not distracting. In the dark areas, transparency is a plus because I can glaze thin layers of color easily to get a depth of shadow that retains some light. 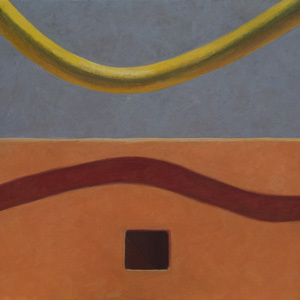 Looking at this painting makes me think about the emotional resonance of color. Most of my paintings have a dominant color. 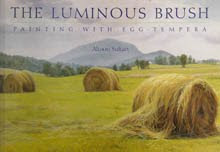 How are our responses to a painting tied to the color of the work? are we able to go past the "I love yellow, therefore...; I dislike red, therefore..." judgment? 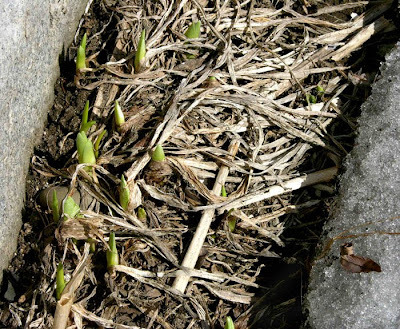 A week ago I wrote a celebratory blog post for the Vernal Equinox, when it seemed that the earth was warming and plants were ready to emerge from sleep. 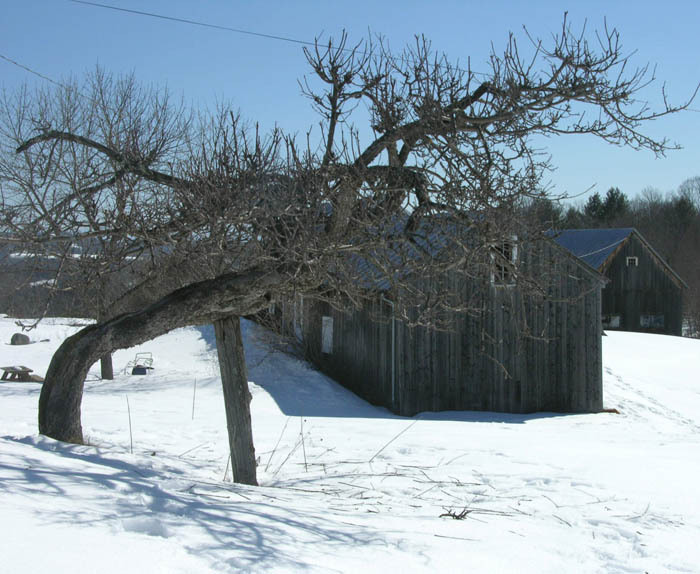 But weather is an uncertain thing, and since that time we've been thrust back into winter, with blustery cold and intermittent snows. The pond is a frozen white expanse, and cattails are dark lines against it. 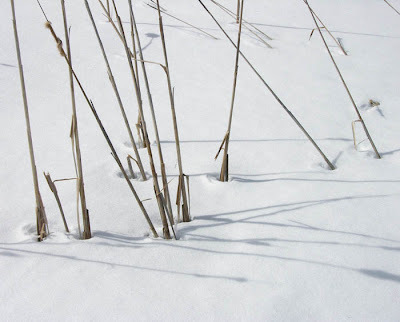 I mark important seasonal milestones in my calendar each year and sigh when I read the events from last year's mild spring: I dug parsnips, meaning the garden ground was well thawed, on March 16th; robins appeared on the lawn on March 24th; wood frogs began quacking in the water of the pond on April 2nd. Birds will not be tempted onto ground still covered with snow and ice. 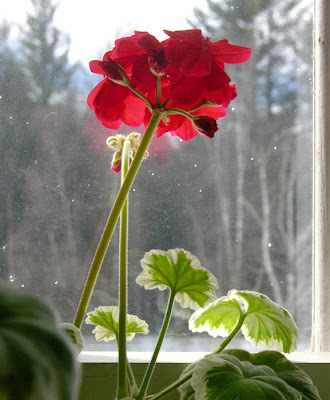 But the plants in the house realize it's spring, as the longer daylight hours encourage them to bloom. The brilliant red geranium, and the tiny blue flowers of rosemary remind me to be hopeful. Spring, however late, will arrive, and will be all the more cherished. 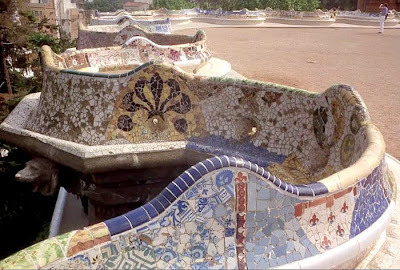 I've long been aware of the unusual character of the works of the Spanish Catalan architect Antonio Gaudí (1852 -1926), having seen photos over the years. 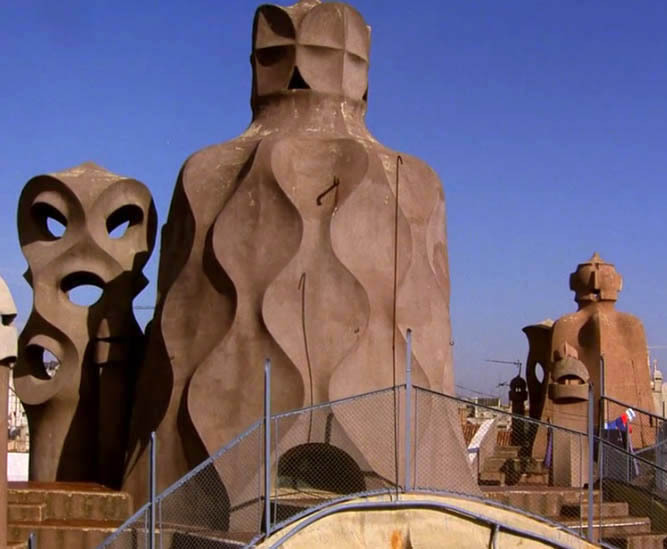 It was not until a few days ago, when I saw the 1984 film Antonio Gaudí by Hiroshi Teshigahara, the director of Woman in the Dunes, that I understood the full extent of his remarkable imagination and unique accomplishment. Matter of fact, I wondered "how in the world did this stuff get made??". The entire time I was watching the film I kept bursting out in exclamations a bit too racy to write here, from sheer astonishment and delight. 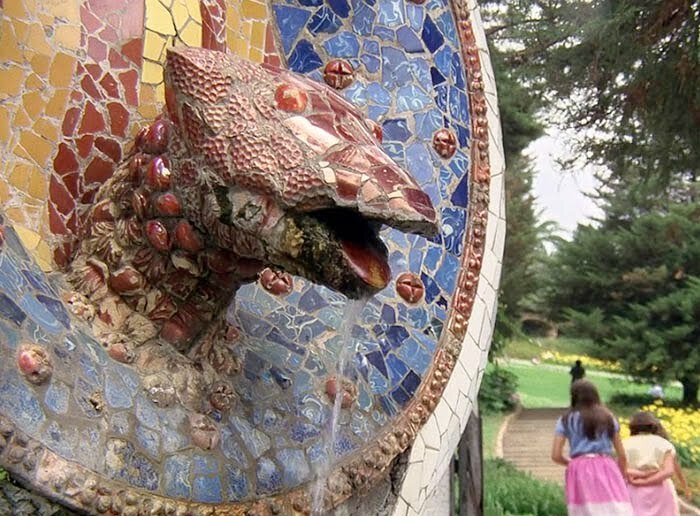 The film is a visual feast, a nearly silent, but music filled, ode to Gaudí, less documentary than poetic essay. The filmmaker took us to rooftops and the pinnacles of towers where dark hooded sentinels stand watch above the city of Barcelona; these wackily decorative elements were some of my favorite aspects of the architecture. 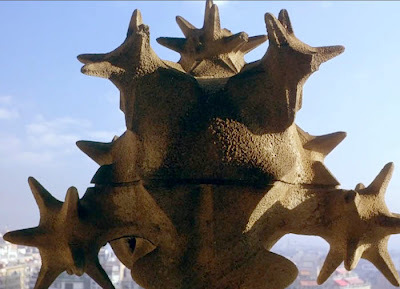 Gaudí's forms are based in geometry and nature, and this powerful shape is atop a tall pillar of the still unfinished cathedral, Sagrada Familia. Its elaborate structure reminded me of a trip I made to the Prado in Madrid years ago, where I saw medieval paintings thick with baubles of shiny colored glass and surrounded by heavy gold. 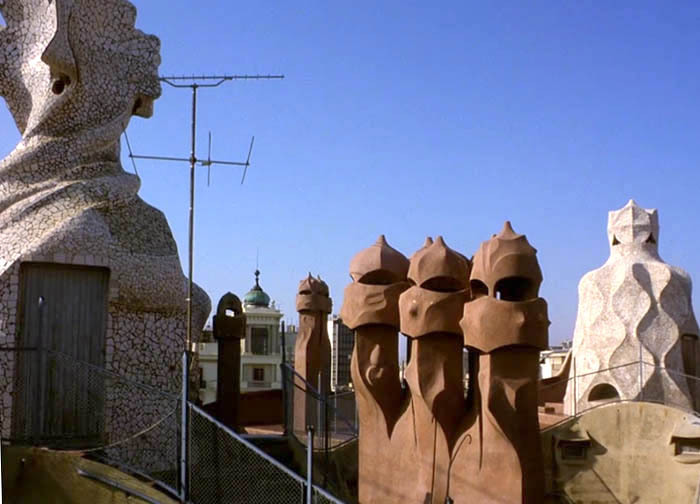 The Spanish character seemed to be far from the rational Italian one, and Gaudí's work celebrates an intuitive imagination. 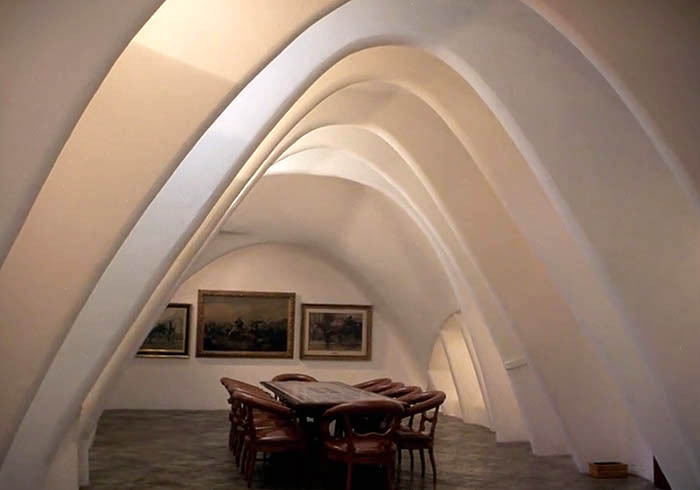 This room feels like the inside of a body, with ribs arching softly overhead. At times during the film, Teshigahara shows us influences on Gaudí, including Romanesque churches and the tall rock formations of Catalonia, that seem to be the inspiration for the tall pinnacles of the Sagrada Familia. 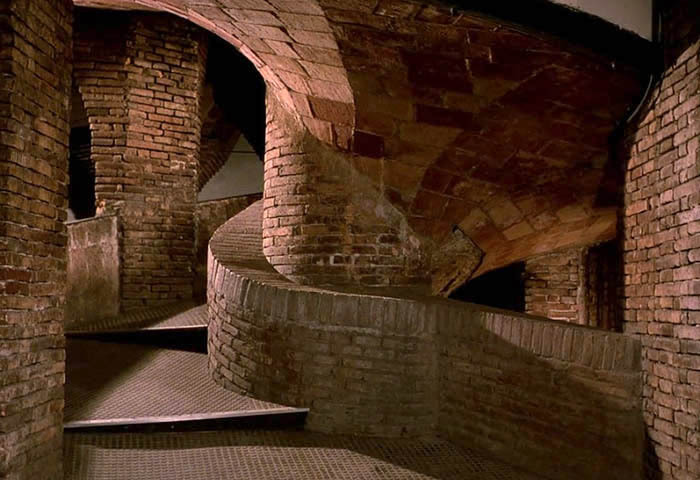 His brickwork above acknowledges that past while doing wonderfully surprising things with arches and pillars. Gaudí's most delightful project is the Park Güell in Barcelona. 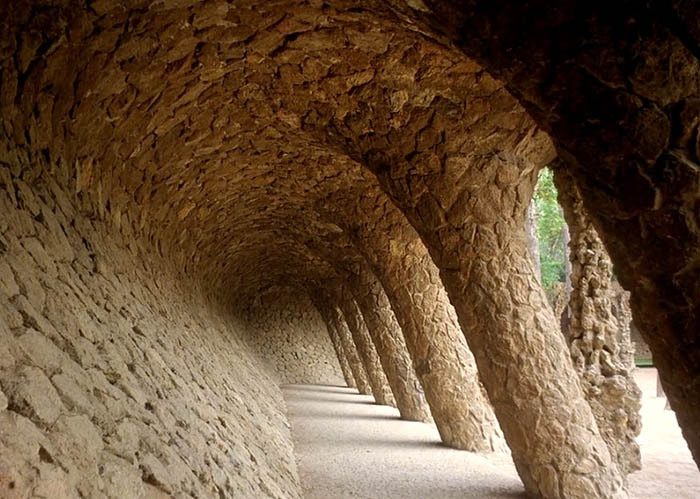 This pillared walkway has the feel of a path through the woods, the irregular stones giving the appearance of rough bark. There is beautiful, randomly pieced tilework in the park, full of life and color, on the creatures living there and on the grand sinuous benches surrounded a large open square. So much color and texture go into the tops of Gaudí's buildings, making them a sheer joy to see. 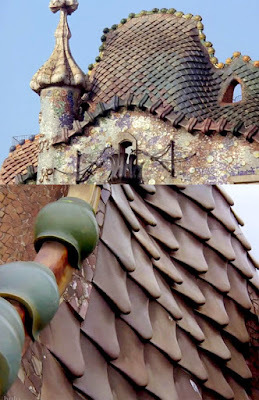 These roof tiles are like something alive, flowing with movement. I began to think about Frank Lloyd Wright, the American early 20th century architect, because he was also inspired by nature in his designs; he was also a architectural genius. 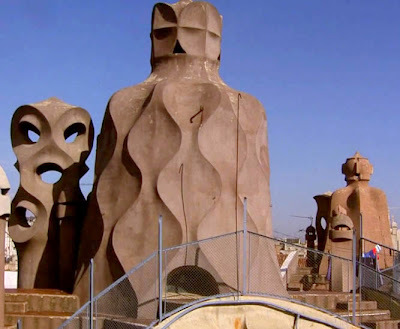 He had many followers, trained at Taliesen East and West, while I believe Gaudí was unique although he collaborated with a large number of architects and artisans. Wright's work now seems almost staid and conventional to me next to the extravagant and powerful inventions of Antonio Gaudí. Green/Yellow Ground, hand dyed wool on linen, 11 x 10 inches. I've gone back to my figure/ground series with this work, in which I attempt a balance of colors and shapes, with none taking center stage. 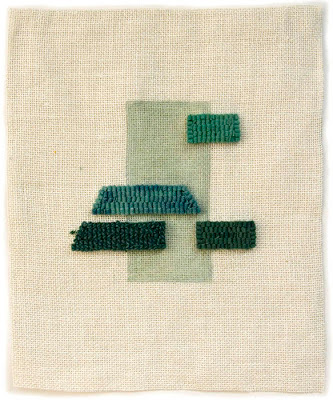 You can see a photograph of the four previous pieces in this series on this blog post. 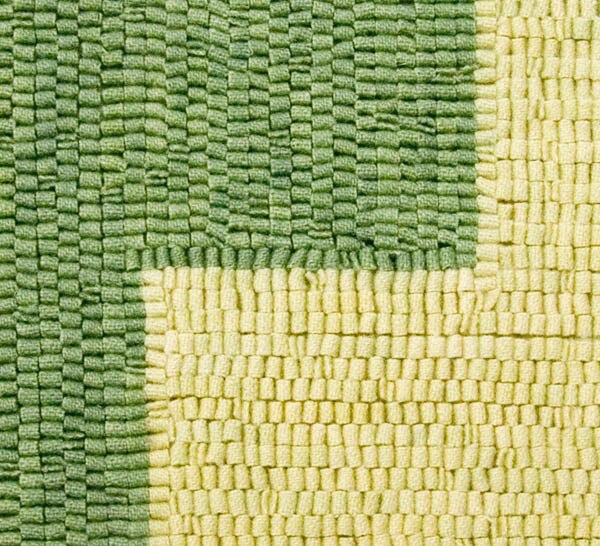 When I dyed the green and yellow wool, I added a little of each color to the other, to tone them down and create more of a relationship. I decided to hook the green shape in a vertical direction because I felt that horizontal lines at top would make the green shape too aggressive in its rightward push. The result is a very simple composition that is satisfying to me. There's also a bit of humor in the faint figural allusion in the shapes. Or is this something only I see? Today, if I write it down, it's because I remember it. The autumn I have is the autumn I have lost. There are rare times when I read a sentence that resonates so strongly within me that it sends my thoughts bouncing about excitedly: "of course, of course!" Aren't all our lives a collection of memories, a gathering of stories always in flux? In his The Book of Disquiet, Fernando Pessoa (1888-1935) poetically wanders through life, noting small events with beautiful prose. In short fragments he writes his thoughts and his belief that he does not truly exist, or that he exists as a multitude of personalities. "I realized...that I am no one." When I first read these words a year ago, I found them so disturbing that I did not continue reading, but now they feel so true. 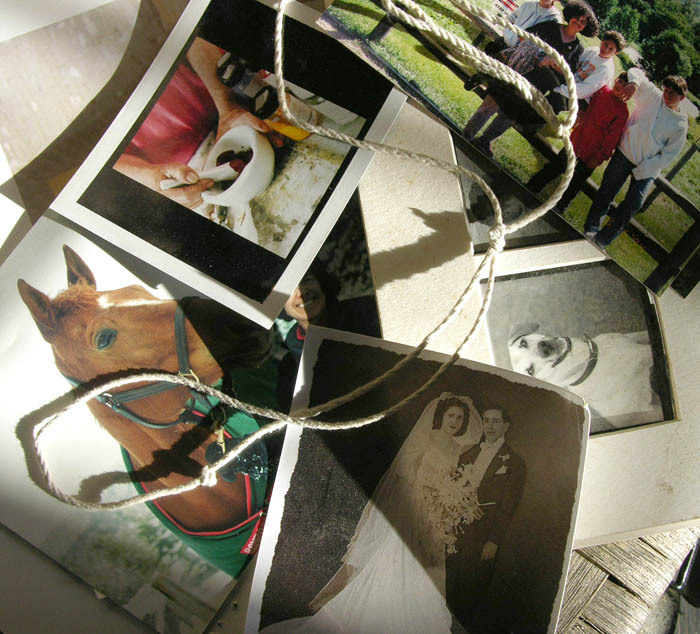 The quote about remembering took me back to the many times I gave lectures on my work, how I spent time arranging slides, gathering quotes, working out an arc for my narrative. Then one year I realized that I had been leaving out an entire body of work because it didn't fit in to the story I'd been telling, so I began to tell it a different way. A life consists of thoughts, of shifting memories. At the risk of boring some readers, I thought I'd show the changes I made in this painting and discuss why I still don't think it's successful. The reworked painting is above, and you can see that I darkened the top area of reddish color, thinking it would compete less with the green. 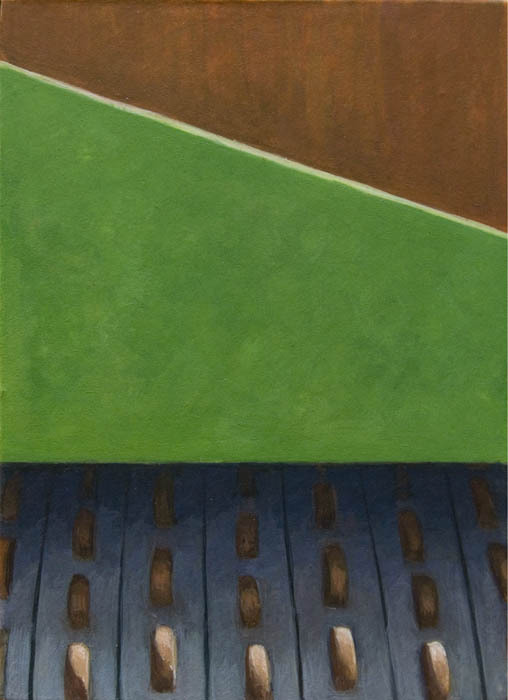 In order to balance the whole, I made the green shape a little smaller at top, so it wouldn't dominate the composition as much, and darkened the bright line at its upper edge. But...the green and red shapes still read too much like flat shapes and have no physical presence. I now believe that this characteristic is at the heart of this painting's problem and it was pointed out by a Facebook friend, Jeff, who wrote that the realistic and abstract spaces, usually coexisting well within my paintings, were pulled apart here. 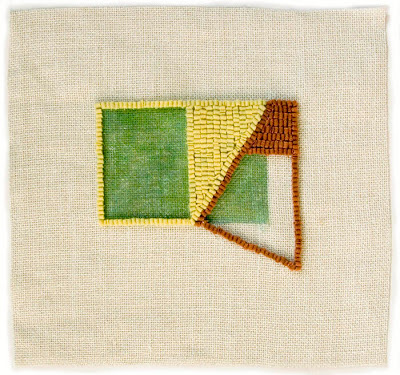 This made me realize something essential to my work: that there is a fine balance to be achieved between the real and the abstract. Red Teeth, egg tempera on calfskin parchment, 5 3/8 x 3 7/8 inches. 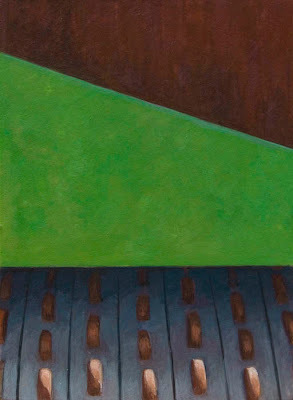 The big color shapes of green and red are what drew me to this image, with the vertical shapes of rounded teeth repeating the earthy red; the dark blue-gray added a third color to the simple composition. Now that the painting is done, I am not very happy with the balance of the composition: I feel that the lower portion of vertical bands and teeth needs to be longer. 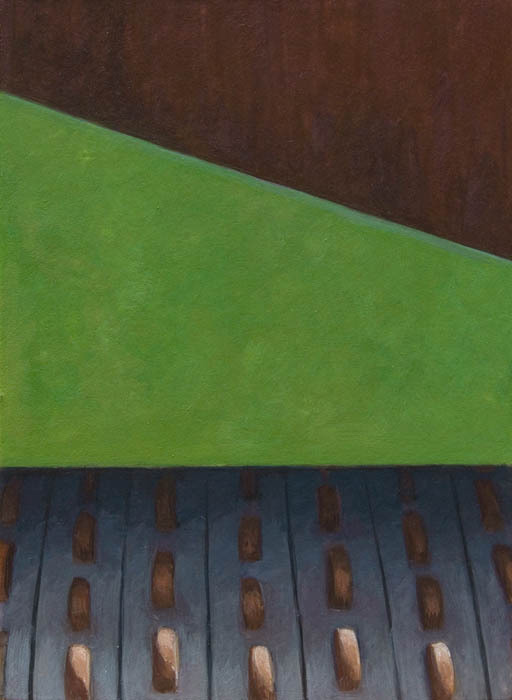 As it is now, the green shape is too dominant; if there was another 1/2 to an inch more of verticality, the parts of the painting would be more at ease with each other. I don't know if you agree with me, but I think this one will go in the "not a success" pile. But....as I look at the image, I wonder if it will work if the red shape on top is a much darker value, pushing it back and having it relate to the dark at bottom. I think I'll give it a try and will let you know the results. The spring awakening has begun. 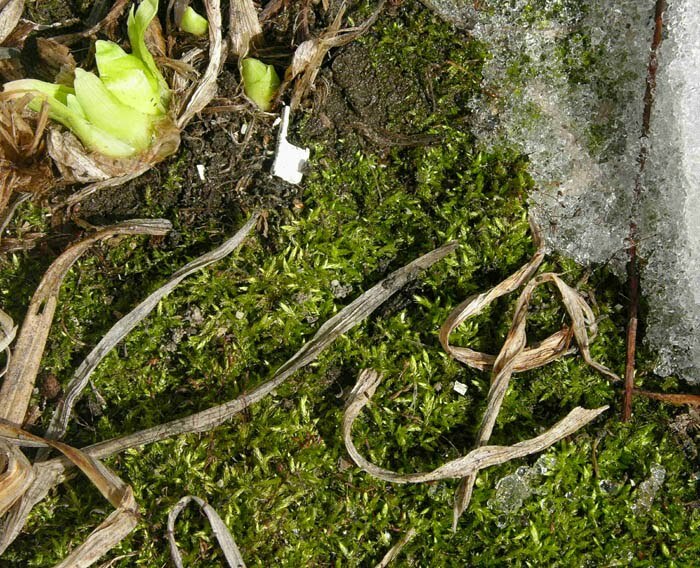 I left home for a brief trip two days ago, and returned to find ground that had been covered with snow beginning to show itself, decorated with bits of green. 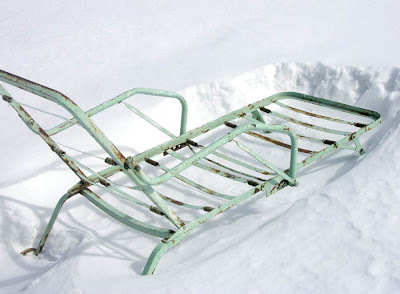 The rapidity of the change is startling; each year I forget how quickly a seemingly endless winter can release its hold. I'd also forgotten that last fall I planted snowdrops along the foundation of my shed, so their pregnant buds were a wonderful surprise. 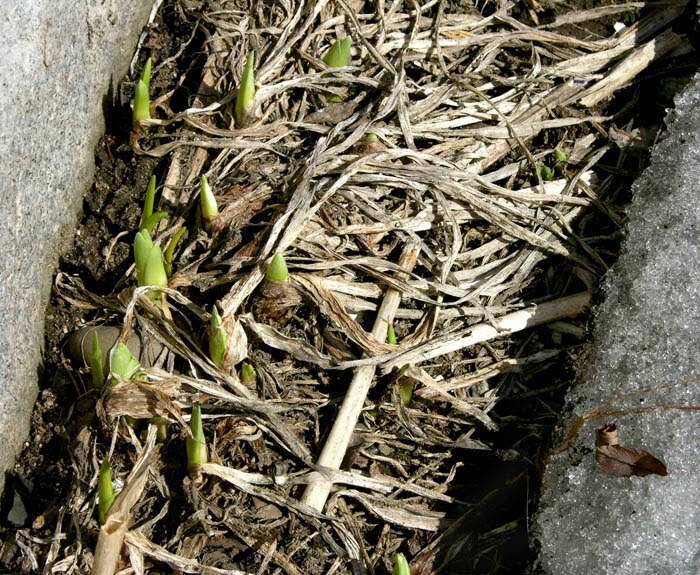 The warmth of the south facing granite foundation encourages the early emergence of daylilies in a narrow band free of icy snow. 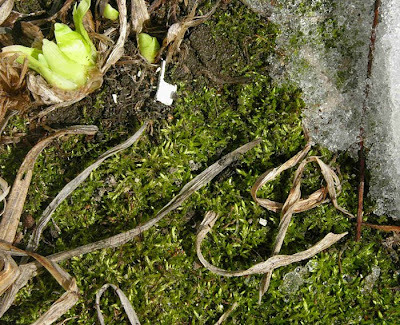 The rich green of moss is patterned with last seasons strappy leaves, while the new daylily shoots are a light green exclamation point. 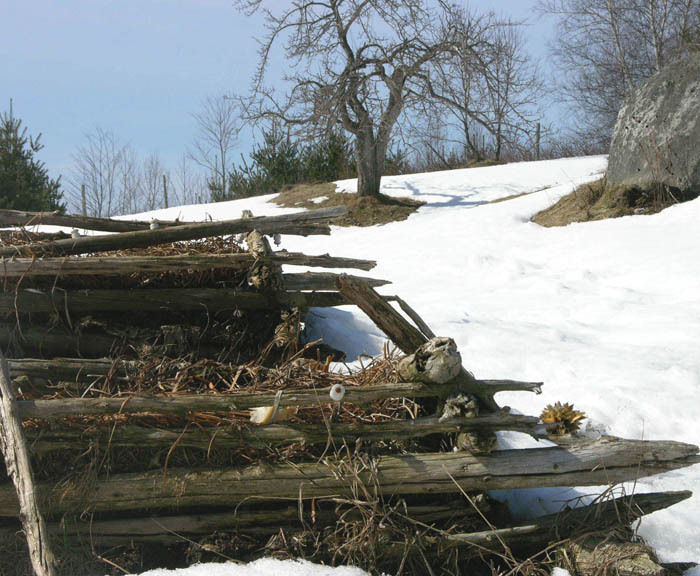 Even the compost piles point to spring as their decomposing warmth has melted the large mounds of covering snow. I can no longer see the little scurrying footprints of the creatures who feed at the pile. 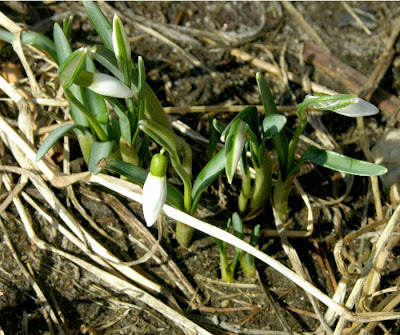 Tonight, March 20th, at 7:21 EST we'll all be celebrating the official beginning of spring. This year winter has been tenacious; we've had only occasional glimpses of spring amidst the cold and snow, which still deeply blankets the ground. Now that I've written this blog for over a year, the seasonal chores come round again: last year I wrote about pruning on March 9th, which you can see here. 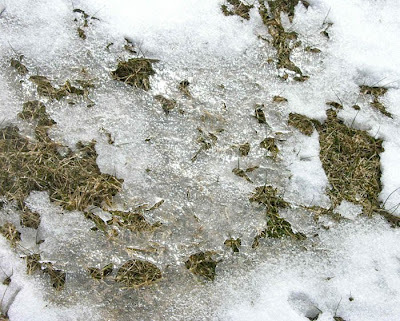 At that time, there were remaining patches of snow, but the ground was mostly bare and there had been many mild days. 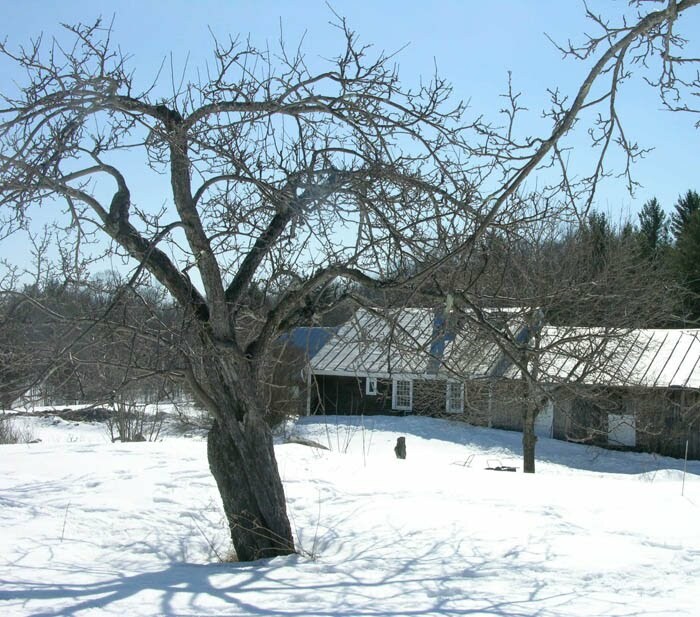 This year, I am excited to be out of doors working on any day that is a harbinger of spring. We had one such day a couple of days ago, and another is coming today, so I put on my snowshoes and take my hand and pole pruners out to the trees. 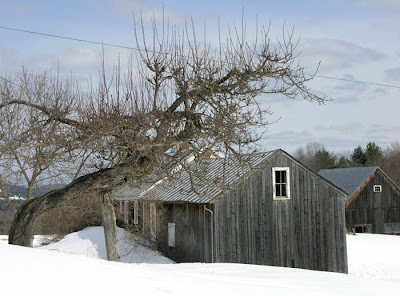 This grande dame of a tree, leaning on her cane, is my favorite; it doesn't bear well, but is so dramatically beautiful. 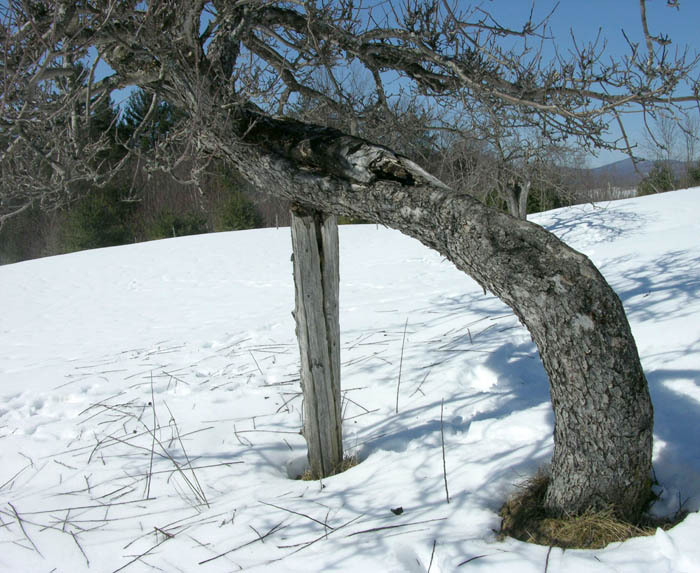 When we prune, we're supposed to encourage outward growth, but this tree has a vigorous habit of sending many thin branches skyward. It is the only tree I have of this variety and the only one to behave this way. A random pattern of branches appears on the snow as I work. I marvel at how insistent this old tree is in growing and refusing to stay in bounds. The tree's wild hairdo is now contained, and I hope that each of the branches I have left will grow thicker and stronger with time. And next year I will have to prune the overreaching branches yet again. 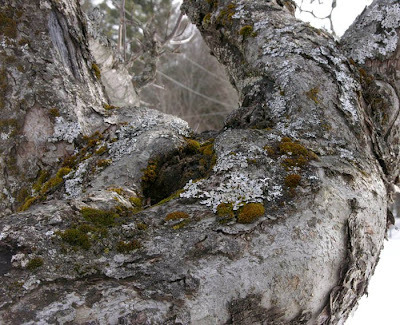 A close look at the aged horizontal trunk shows a landscape in miniature, full of textured ground and small green hills of lichen. I feel that I am looking at an illustration of the passage of time in the scaling bark and depressions in the surface. After finishing the leaning tree, I move into the small orchard behind the house to prune the dozen or so old trees there. They are all antique varieties and bear fruit only every other year. This is their on year, so I have apples to look forward to this fall, and the making of apple sauce and apple butter, which I will store for a year or two's eating. 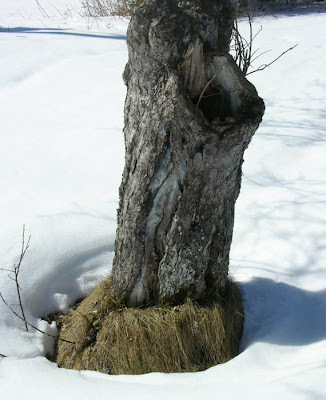 Lastly, I wanted to show one of my favorite signs of spring, that I look for each year with pleasure: the widening circles bare of snow around the base of tree trunks, meaning that renewed life and warmth are on the way. 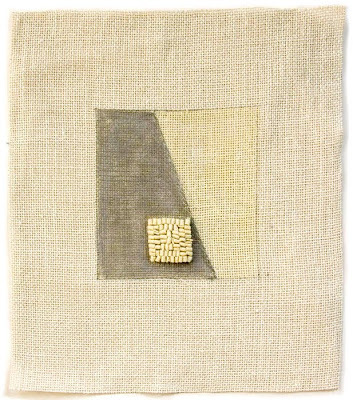 2011 #9, hand dyed wool and egg tempera on linen, 13 x 13 1/2 inches. 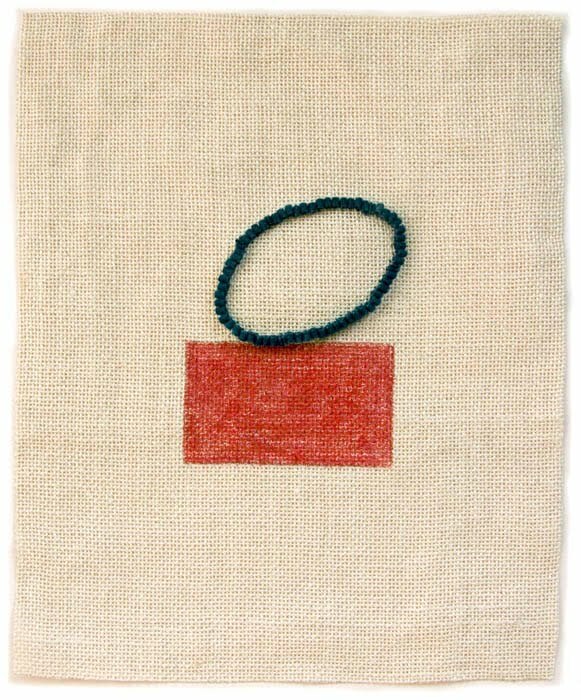 2011 # 10, hand dyed wool and egg tempera on linen, 13 1/2 x 11 1/2 inches. 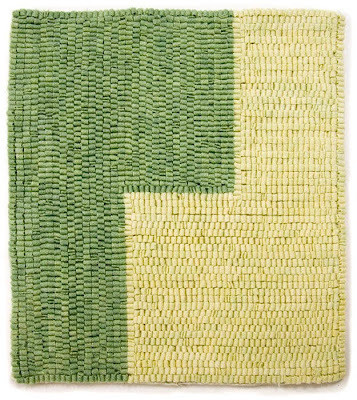 I am definitely not placing myself in the "great artist" category, but maybe Eliot's mature artist works for me, and I'm certainly making something different; I steal ideas from other artists for my textile work all the time, not for my painting. One more comment on one of the pieces: I am not completely satisfied with #12, because I think the hooked forms are a bit too heavy. 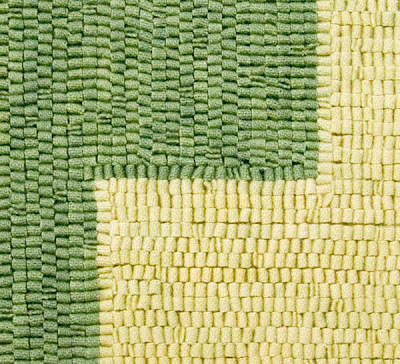 Because the texture of the linen would be too much changed if I tried to remove a row of hooking, I am left with the piece as it is, not bad, not good, at least to my eye. 2011 #11, hand dyed wool and egg tempera on linen, 14 x 11 1/4 inches. 2011 #12, hand dyed wool and egg tempera on linen, 14 x 11 3/8 inches. Christoffer Wilhelm Eckersberg, Portrait of a Young Woman, 1815; oil on canvas; 12 1/4 x 8 3/8 inches. 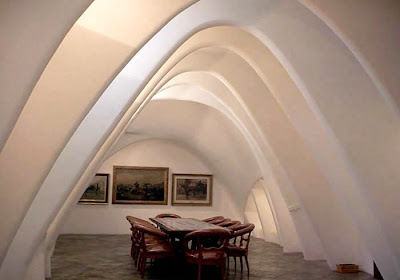 I can still remember my surprise and delight when I first saw the collection of paintings from the Danish Golden Age at museums in Copenhagen thirty years ago. 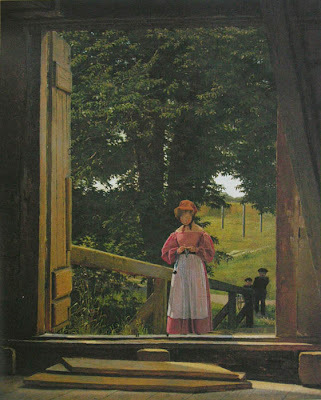 During this period in the first half of the 19th century there was an outpouring of beautiful, sensitive, and rather modest painting (notice how small these paintings are). I showed landscapes from this period, along with some from Australia, in this post, but now I'd like to present some figure paintings. 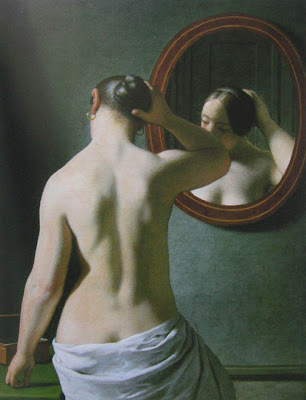 Christoffer Wilhelm Eckersberg, Woman Standing in Front of a Mirror, 1837; oil on canvas; 13 1/8 x 10 1/4 inches. Eckersberg, seen as the "father of Danish painting", brought a clear realism to his work, tempered by a classical sense of composition, learned as a student of Jacques-Louis David in Paris. The touching portrait of a young woman in her finery has a crispness of form and a quality of light that almost shimmers with life. The more severely classical woman before her mirror becomes a solid, graceful presence, with each shape flowing into another, each part in perfect balance. 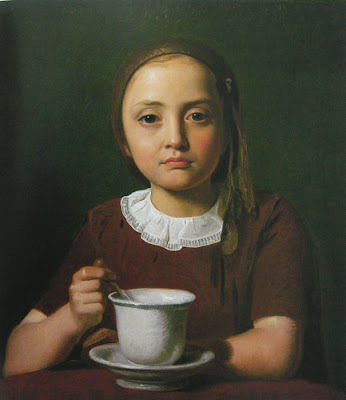 Constantin Hansen, Portrait of a Little Girl, 1850; oil on paper on canvas; 15 3/8 x 14 inches. I don't think I've ever seen another such direct, powerful portrait of a child, so self assured and penetrating. She seems to question our own being, our place in the world. 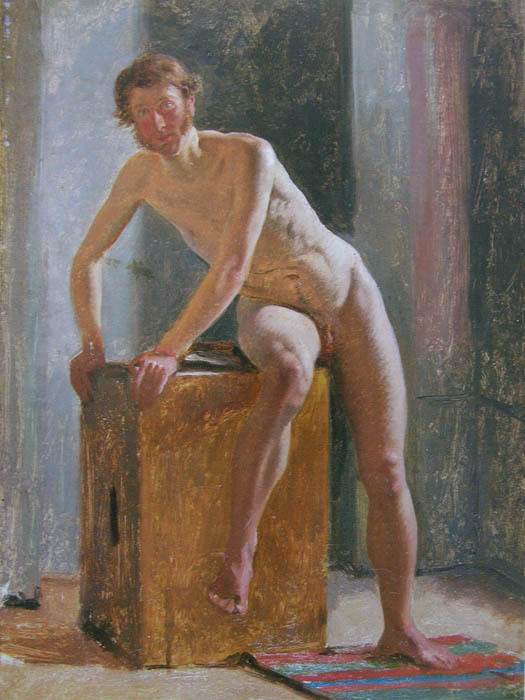 Constantin Hansen, Male Model Sitting on a Box, 1833; oil on canvas; 12 7/8 x 9 1/8 inches. 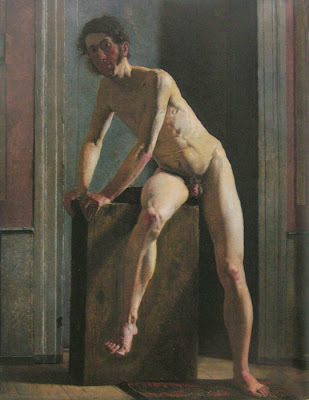 Christen Købke, Male Model, 1833; oil on canvas, 21 1/4 x 17 1/8 inches. Isn't it fun to be able to see figure studies by two artists who were sitting side by side in a modeling session, which was under the tutelage of Eckersberg. Although the two paintings are different in the development of the form and the quality of light––Hansen's being less solid but more light-infused––we can see that light was a prime concern for both. Christen Købke, Portrait of Frederik Sødring, 1832; oil on canvas; 16 5/8 x 14 7/8 inches. 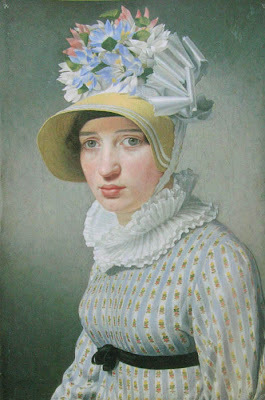 I love this portrait by Købke, so fresh and alive. Although full of objects and details, its structure is simple and strong. That bit of strong red sitting on the table looks like a bit of an artistic joke, which demands some attention and contrasts with the calm, happy face of the subject, a friend of the artist. 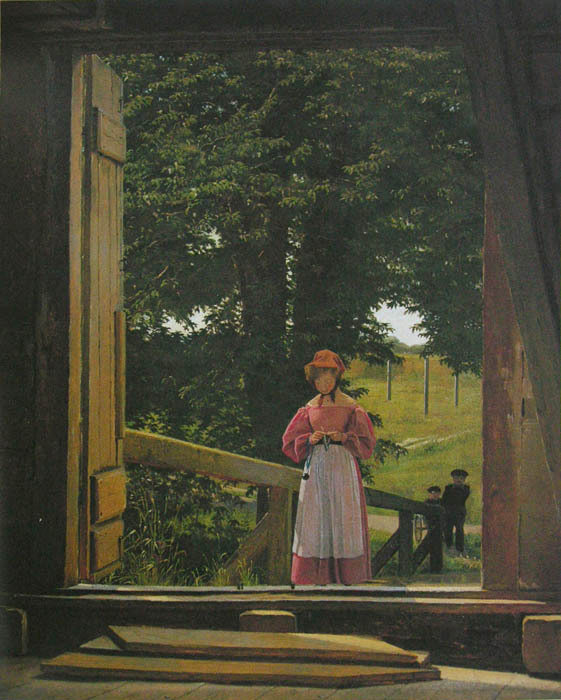 Christen Købke, View from a Grain Loft in the Citadel, 1831; oil on canvas; 15 3/8 x 12 inches. This is another favorite of mine. Looking outward from a dark interior, we see a sunlit world, lush and green. The soft red dress of the woman sets her apart from her surroundings, and we see that she is absorbed in a task, paying no attention to the children behind her. 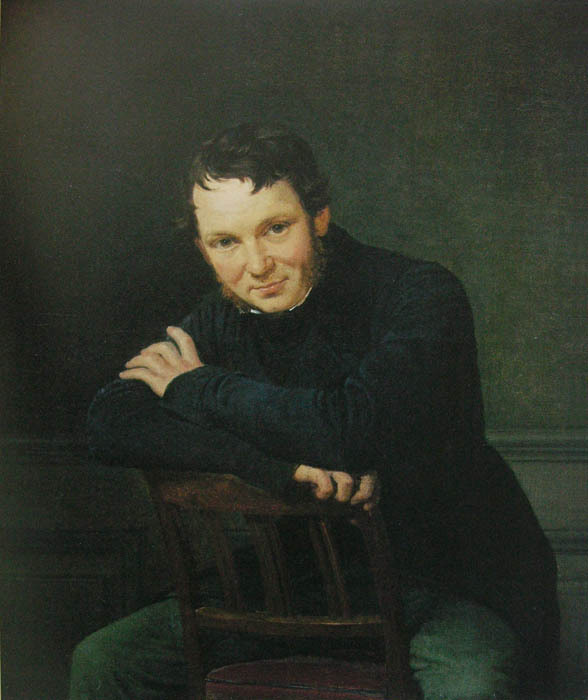 Wilhelm Marstrand, Portrait of the Architect Gottlieb Bindeshøll, 1834; oil on canvas; 12 3/8 x 10 1/4 inches. 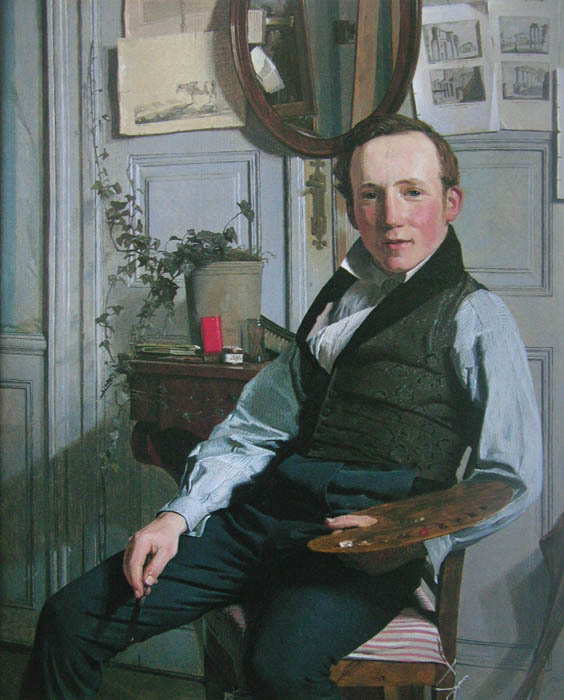 With this portrait by Marstrand we see yet another painting that is so direct, so bursting with life that it seems that Danish painters had a particular gift in capturing a human presence with the play of feelings across a face, with gesture and with light.